Black spot of a papaya is a fungal disease that is now found worldwide where papaya trees can be grown. 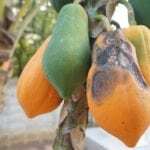 Usually papaya with black spots is a fairly minor problem but if the tree becomes heavily infected, the growth of the tree can be affected, hence fruit yields so treating papaya black spot before the disease progresses too far is of paramount importance. Black spot of papaya is caused by the fungus Asperisporium caricae, previously referred to as Cercospora caricae. This disease is most severe during rainy periods. Both the foliage and fruit of papaya may be infected with black spots. Initial symptoms appear as small water-soaked lesions on the upper side of leaves. As the disease progresses, small black spots (spores) can be seen on the underside of leaves. If leaves are severely infected, they turn brown and die. When leaves die off extensively, overall tree growth is affected which lowers the fruit yield. Brown, slightly sunken, spots may also appear on fruit. With fruit, the issue is primarily cosmetic and it can still be eaten, although in the case of commercial growers, is unfit for sale. The spores, black spots on the papaya leaves, are spread in wind and wind-driven rains from tree to tree. Also, when infected fruit is sold at markets, it spreads exponentially. There are papaya varieties that are resistant to black spot, so control will be either cultural or chemical or both. To manage black spot of papaya, remove any infected leaves and fruit at the first sign of infection. Burn infected foliage or fruit, if possible, to help prevent the spread of the disease. Protectant fungicides that contain copper, mancozeb, or chlorothalonil can also be used to manage papaya black spot. When using fungicides, be sure to spray the undersides of the leaves where the spores are produced. Read more articles about Papaya Trees.